>Wednesday ratings are settling into predictable patterns for the most part, and Suburgatory on ABC had a decent second week. FOX’s The X-Factor seems to settling around a high-3 or 4 rating. 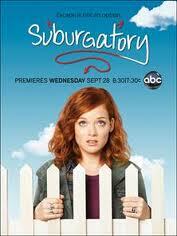 ABC’s Suburgatory fell to a still-good 3.0 rating in its second episode but still grew from its Middle lead-in. Last week Suburgatory grew from a 2.7 lead-in to 3.3; this week was a 2.7 to a 3.0. Modern Family seems to be settling in around a mid-5 rating, which is a full rating point ahead of last year at this time. Revenge dropped another 0.2 from last week to a 2.5. To have any life on the network longterm, the Hamptons drama really needs to stop eroding immediately and stay at this level. For the night ABC was a very close #3 with a 3.2 (only 0.3 away from first place). On the same night last year (10.6.2010), ABC was in third place for the night, averaging a 2.5 rating: The Middle (2.5), Better with You (2.3), Modern Family (4.6), Cougar Town (3.0), The Whole Truth (1.3). FOX won the night narrowly with a 3.5 rating. A 90-minute The X Factor did a 3.9 and a 9:30 episode of Raising Hope crashed down to a 2.3. Last week’s X Factor was a 4.1 in the final nationals — we expect the show to get its usual bump in the finals this afternoon to a 4.0. For now it seems that The X Factor is settling at a nice level. This night last year, FOX was in second place with a 3.1 rating: Hell’s Kitchen (3.0) at 8 pm and Hell’s Kitchen at 9 pm (3.3). CBS is tied for second for the night with a 3.2 rating. Criminal Minds bounced back to a 3.8 rating (up 0.2 from last week), while Survivor dropped 0.1 and CSI fell 0.2 from last week. All in all, the CBS shows seemed to have found their basic levels though. CBS won the third Wednesday last year with a modest 3.2 rating: Survivor (3.8), Criminal Minds (3.5), Defenders (2.2). NBC’s Up All Night has stabilized at a 2.2 rating (up 0.1 from last week), and Free Agents has settled into its grave at a 1.0 rating (same as last week). Harry’s Law and Law & Order: SVU look steady at a 1.2 and 2.1 rating, respectively. The Peacock averaged a fourth-place 1.6 for the evening. NBC was in fourth place on this night last year with a 2.2 rating: Undercovers (1.5), Law & Order: SVU (2.6), Law & Order: Los Angeles (2.4). The CW’s H8R dropped back down to an ignominious 0.4 rating, while America’s Next Top Model has stabilized at a 0.8. Season to date (through 17 nights of the season), CBS leads with a 3.2 rating, followed by FOX with a 3.1. ABC remains in third (2.6) and NBC trails (2.4). The CW is averaging a 0.7 season to date.